Aortic regurgitation is retrograde blood flow into the left ventricle from the aorta secondary to incompetent aortic valve. The most common causes of aortic regurgitation are rheumatic fever and infective endocarditis complicating a previously damaged valve. This can be a congenitally abnormal valve (e.g. a bicuspid valve) or one damaged by rheumatic fever. There are numerous other causes and associations (Table 3.3). The majority of patients with aortic regurgitation are men (75%), but rheumatic aortic regurgitation occurs more commonly in women. In aortic regurgitation, significant symptoms occur late and do not develop until left ventricular failure occurs. As with mitral regurgitation, a common symptom is ‘pounding of the heart’ because of the increased left ventricular size and its vigorous pulsation. Angina pectoris is a frequent complaint. Varying grades of dyspnoea occur depending on the extent of left ventricular dilatation and dysfunction. Arrhythmias are relatively uncommon. * pistol shot femorals - a sharp bang heard on auscultation over the femoral arteries in time with each heart beat. The apex beat is displaced laterally and downwards and is forceful in quality. On auscultation, there is a high-pitched early diastolic murmur best heard at the left sternal edge in the fourth intercostal space with the patient leaning forward and the breath held in expiration. Because of the volume overload there is commonly an ejection systolic flow murmur. The regurgitant jet can impinge on the anterior mitral valve cusp, causing a mid-diastolic murmur (Austin Flint). 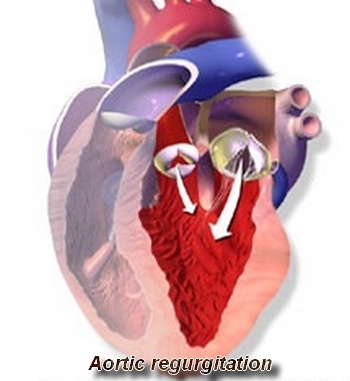 • The most common cause of isolated severe aortic regurgitation is aortic root dilation. • Infectious endocarditis is the most frequent cause of acute aortic regurgitation. • Widened pulse pressure (markedly increased systolic blood pressure, decreased diastolic blood pressure) is present. • Bounding pulses, head “bobbing” with each systole (de Musset’s sign) are present; “water hammer” or collapsing pulse (Corrigan’s pulse) can be palpated at the wrist or on the femoral arteries (“pistol shot” femorals) and is caused by rapid rise and sudden collapse of the arterial pressure during late systole; capillary pulsations (Quincke’s pulse) may occur at the base of the nail beds. • A to-and-fro “double Duroziez” murmur may be heard over femoral arteries with slight compression. • Popliteal systolic pressure is increased over brachial systolic pressure =40 mm Hg (Hill’s sign). The underlying cause of aortic regurgitation (e.g. syphilitic aortitis or infective endocarditis) may require specific treatment. The treatment of aortic regurgitation usually requires aortic valve replacement but the timing of surgery is critical. Because symptoms do not develop until the myocardium fails and because the myocardium does not recover fully after surgery, operation is performed before significant symptoms occur. The timing of the operation is best determined according to haemodynamic, echocardiographic or angiographic criteria. Both mechanical prostheses and tissue valves are used. Tissue valves are preferred in the elderly and when anticoagulants must be avoided, but are contraindicated in children and young adults because of the rapid calcification and degeneration of the valves. Antibiotic prophylaxis against infective endocarditis is sometimes necessary if a prosthetic valve replacement has been performed. • In general, the “55 rule” has been used to determine the timing of surgery: surgery should be performed before EF <55% or end-systolic dimension >55 mm. Variable depending on underlying condition and left ventricular function; aortic regurgitation (except when secondary to infective endocarditis) is generally well tolerated, and patients remain asymptomatic for years. Fig. 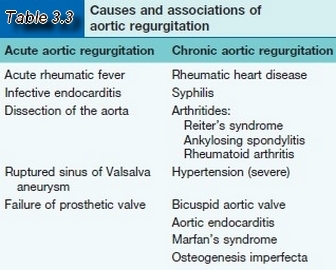 3.8 Features of aortic stenosis and aortic regurgitation.